With a dominant performance by Paul Pogba in the first half, Manchester United eliminated Chelsea from the FA Cup and qualified to quarterfinals. After getting suspended in last week’s Champions League match vs PSG, Manchester United’s Paul Pogba felt like he needed to step forward and try to make amends from his mistakes against Chelsea this Monday in the FA Cup. The French midfielder led the Red Devils to a very important victory at Stamford Bridge that proved this squad really is back in top form, the loss against the French giants was unfortunate but they managed to bounce back from the setback in due time for this new victory. The match was extremely difficult for both sides, Chelsea was playing great football but the Manchester United defense was on point for pretty much the whole 90 minutes of the game. The Red Devils proved that they are willing to hold their ground against any competitive squad, they were able to maintain composure during the first half hour of the game and Pogba was right there for the two key moments of the match and he responded to the pressure mounting over his shoulders after getting sent-off against Paris Saint-Germain last week. At least Paul had the chance to be decisive in this competition, one that gives them a higher opportunity to actually get some silverware by the end of the season. After those first thirty minutes that practically saw all 22 players in top form, Pogba appeared out of the blue to send a beautiful cross to Ander Herrera who headed the ball in the back of the net. Despite Chelsea’s constant efforts, it was clear that Manchester United was the dominating side of this match and the Blues really had very little chances of getting back in the game with the little influence they had. Manager Maurizio Sarri’s days are numbered at Chelsea, it is only a matter of time before the club’s board of directors and the owner decided to give him the boot. 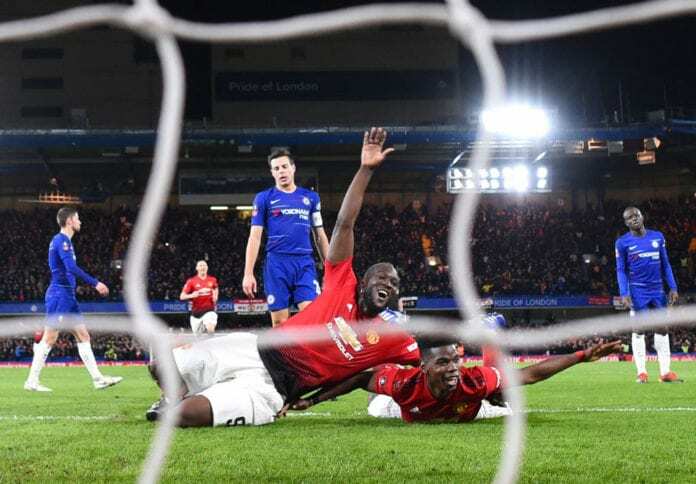 The final nail on the manager’s coffin came just before the half-time whistle, as Paul Pogba himself led the play in which he received another perfect cross from Marcus Rashford and scored Manchester United’s second goal of the evening that signified the 2-0 victory at Stamford Bridge. None of the Chelsea players were able to get back up from this massive blow, Eden Hazard tried his best to at least get one goal back for his squad but they were playing against one of the most competitive sides in English football today. The match ended with that final 2-0 result and with Manchester United getting the last ticket to the FA Cup’s quarterfinal draw, which has given them the chance to play against Wolverhampton up next. This victory was very important for the Red Devils’ morale, they needed to get a positive result ahead of what’s coming for them in the Premier League next weekend. Manchester United plays at home on Sunday against Liverpool FC, the most thrilling rivalry in English football that takes on a whole new dimension because of the Red Devils’ recent top form. Before the start of 2019, we could’ve bet against Manchester United and possibly won some money due to how poorly they were performing. Ole Gunnar Solskjaer’s arrival to the squad has given them a very different motivation, they actually have a chance to upset Liverpool in the competition and also give Manchester City a boost in their quest for their second consecutive title. Getting another positive result against the Reds will also get them a great confidence boost for the Champions League return leg vs PSG, they really need one if they want to get a victory of more than two goals at Parc des Princes and qualify to the tournament’s quarterfinals in order to remain alive in the competition. Getting that next round ticket will be very complicated, but not impossible. What do you expect from Manchester United’s next two matches in both the Premier League and the Champions League? Please share your opinion in the comment section down below.